Organize all your inventory for instant selection. Instant accessibility to one piece or a full load. 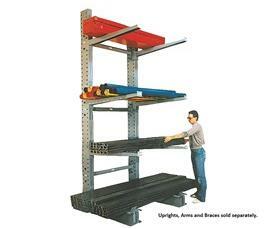 Makes efficient, time-saving work of storing long or awkward lengths of pipe, bar, tubing, lumber, poles, etc. Forklift easily loads on or off arms and bases. Bases can be used for extra storage. For longer materials, simply add braces and upright columns to fit your needs. Arms are adjustable 3" up and down the full length of the upright. Uprights are punched on both sides for use as single-sided or double-sided units. Arms and Uprights are ordered separately. All rugged heavy-gauge steel construction for sure, safe support of heavy loads and long life. FOB Shipping Point. HU837 Standard heavy duty/Single sided 8' 21500/24" Arms 37"
HU1037 Standard heavy duty/Single sided 10' 21300/24" Arms 37"
HU1237 Standard heavy duty/Single sided 12' 20900/24" Arms 37"
HDU865 Standard heavy duty/Double sided 8' 43000/24" Arms 65"
HDU1065 Standard heavy duty/Double sided 10' 42600/24" Arms 65"
HDU1265 Standard heavy duty/Double sided 12' 41800/24" Arms 65"
HXU1240 Extra heavy duty/Single sided 12' 28700/24" Arms 40"
HXU1440 Extra heavy duty/Single sided 14' 28400/24" Arms 40"
HXDU1266 Extra heavy duty/Double sided 12' 57400/24" Arms 66"
HXDU1466 Extra heavy duty/Double sided 14' 56800/24" Arms 66"